Guest appraiser Greg Shipley has been a passionate collector of early Americana and Native American artifacts over 50 years. Editor’s note: This is Part 1 of a 5-part series leading up to the Antiques Appraisal Fair on April 25. Five experienced appraisers will be positioned in locations throughout the museum to accommodate attendees by describing the history and estimated value of each item presented. The first appraiser to be highlighted is Greg Shipley. 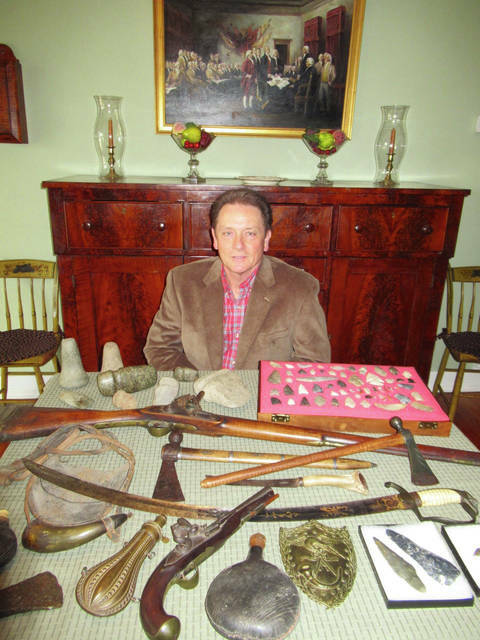 Shipley has been a passionate collector of early Americana and Native American artifacts over 50 years. Early Americana items include relics from the Colonial and Federal eras (1620-1820). Native American artifacts include stone and flint arrowheads and cutting implements, trade goods, tomahawks, beads and wampum. Shipley is an avid amateur archaeologist whose favorite part of collecting is hunting for artifacts in the field. He looks forward to the Appraisal Fair and helping people learn the approximate value of their prized possession. Tickets may be purchased at the museum (Mondays and Tuesdays), at local banks – Civista, First Central National, Peoples, Perpetual, all county Security locations – and on line at www.champaigncountyhistoricalmuseum.org. In addition to benefiting the museum and preserving its artifacts, this will be a fun event for people of all ages to enjoy and hopefully one that will build from year to year. This is an excellent opportunity to have a family heirloom, an item from the attic, or perhaps something found when spring cleaning to be evaluated. Information from the Champaign County Historical Society.